Good news for all of us snowmobilers who get tired of problems with clutch bushings and having to service their drive clutch so often. Many of us still own and use an original 911 Response clutch cover from Hi-Tech Innovations, good old Duane Watt. SnowTech introduced you to Duane back in 1997 with his encapsulated roller secondary that is now common issue on so many brand new sleds – that came from Duane. 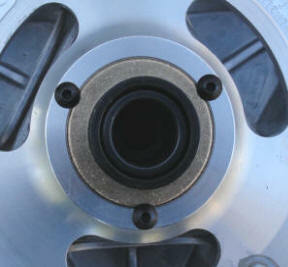 At that time we also introduced you to the 911 Response Cover and its over-sized bushing. Since that time Duane has been quietly making some covers and roller clutches, but never really got hooked up with a good marketing partner to handle the sales end of things. Duane is an engineer and not a marketing type. Enter Thunder Products. Lonn Peterson at Thunder Products has been a long time friend of Duane Watt, and the two have recently come to an agreement where Thunder Products is licensed to use the patented technology of the 911 Response clutch cover. What makes the 911 Response clutch cover so special? It’s all about keeping everything parallel and able to shift smoothly without binding of the sheaves. With the Thunder Products 911 Primary Clutch Cover, the moveable sheave is constantly moving up and down the small diameter clutch shaft of the fixed sheave. The little fiber bushing in the clutch cover is supposed to help keep the far end of the moveable in line and tracking smoothly, along with the moveable bushing down at the sheave itself. Problem is, as the primary is opening and closing, the drive belt is only being grabbed at any given moment by about 30% of the clutch diameter. All of the engine’s power is being applied to squeeze the clutch shut, so if there is any rocking or binding occurring the clutch is not going to shift as quickly or as smoothly as it should or could. 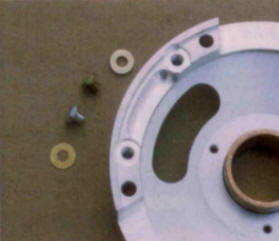 Thunder Products 911 Primary Clutch Cover. The 911 Response cover increases the bushing surface area by 150 to 200% (depending on the application). Instead of a (cheap) high-wear fiber bushing, the 911 system uses an over-sized oilite bronze bushing in the cover and places a larger diameter hardened melonite sleeve over the existing fixed shaft for greatly improved hardness, wear and lubricity. The sheaves remain parallel so all clutch components stay straight and true longer, with no rocking, binding or over-revving. Over-revving? 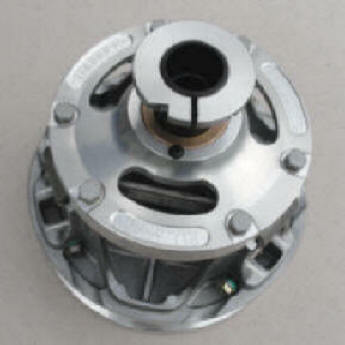 A lot of over-revving comes from binding of the primary clutch with worn or sloppy bushings. Once we have removed the sticktion and binding, the clutches are free to shift and will transmit more power more smoothly. Less bogging, smoother shifting, and years of it. Another advantage of the 911 Response clutch cover is we’re replacing a cheapo cast cover with a billet machined cover that is a full-circle instead of being triangularThunder Products 911 Primary Clutch COver like the OEM ones. The 911 cover is thicker, stiffer and stronger, helping to provide rigidity to the entire clutch assembly. The strong cover frames the towers to keep them from spreading and flexing, especially with big power engines. Thunder Products has added yet another cool feature to the new 911 Response covers. They have added precision threaded balancing holes on the back side of the cover so you can balance the entire clutch assembly. 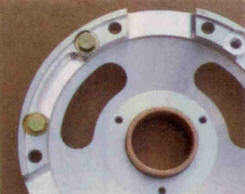 Normally, clutches are balanced by drilling holes in the sheave end to balance it. Now using the threaded holes in the911 cover, we can add small amounts of mass for precision balancing using small bolts and shims like what a Thunder Shift kit uses. No more need to drill holes and burn bridges, you now get adjustable balancing capability. Priced at only $239.00, the 911 Response Clutch Cover is a bargain compared 911 Cover adjustment holes to the wicked expensive billet clutches made for high-powered sleds. The 911 Response Clutch Cover alone gives you much of the strength and rigidity that you need at a fraction of the cost. Any and all of the 150 HP class sleds would benefit from this simply from having the clutch act like new for a lot longer. By keeping the sheaves parallel most clutch parts should last longer as well. You will very likely never need to replace the cover bushing again. AND you also get Thunder Product’s external sheave adjuster so you can adjust the moveable sheave and set the belt side clearance, instead of having to tear the clutch apart or install a new drive belt when it starts to narrow. This is a sweet package. 911 Response Clutch Covers are manufactured and sold by Thunder Products for $239 and are offered for most late model Arctic Cat, Polaris and Yamaha applications.